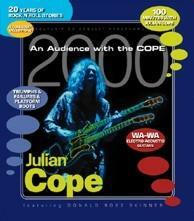 Julian Cope - "An Audience With The Cope 2000"
Julian Cope is an odd cookie indeed. He plays some space rock, but could not exactly be called a space rocker. He plays some Krautrock, but he's neither German, nor classifiable along with their kin. He plays exuberant pop, but rarely breaks into the pop charts. He plays eccentric folk, but he's not a folk musician either. And he speaks his mind, whether it's politically correct to do so or not. Scanning the racks of your local CD shop, it's fairly easy to find his alt-rock albums from the Island label years of the late 80's and early 90's, such as World Shut Your Mouth, and the classic Peggy Suicide. But getting your hands on his more eccentric and eclectic stuff is a much more difficult endeavour. Such is the case with Cope's latest 'album', An Audience With the Cope 2000. It's available only through his Head Heritage Web Site (similar to earlier releases such as Rite2 and the vocal mantra freak-out Odin). And despite the fact that it features almost an hour of new Cope music, it's not exactly an album, per se. Audience was released as a "Souvenir CD Concert Programme" for Julian's Autumn 2000 tour. Yet there's no information included about the tour in the CD. On the album cover, it proclaims "Julian Cope in Concert" and "20 Years of Rock 'n Roll Stories" but unless the audience sounds are completely obliterated from the mix, this is neither a live album, nor a retrospective of Cope's career. No one ever accused Cope of lacking internal contradiction. So what is An Audience with the Cope 2000, exactly? Well, what it is is a pretty good album of new material, expressing Cope's more eccentric side, indulging in both his love of space rock and Krautrock. The 26-minute epic, The Glam Dicenn, a millennial celebration of ancient British mysticism, spaceships, dancing, and rock and roll, dominates the album. Split into two parts (one about 10-minutes, the other about 16-minutes) that frame the album, the first part opens with a simple wah-wah'ed guitar and processed vocals before kicking into a thumping guitar-rock freak-out (courtesy of lead guitarist Doggen), given a monumental feel with washes of sound from Thighpaulsandra's synths and Julian's Mellotron, and pounding percussion by Kev on pedal tympani. Holy Mother of God is pure psychedelic pop. Its spacey and orchestral textures fall in nicely with the spiritual concerns addressed in the lyrics. Born to Breed is a rock 'n roll rave up with howling monkey-like vocals and wildly gurgling keyboard textures. Not sure what Julian is suggesting with the lyrics on this one, as they are not printed in the liner notes with the album's other lyrics, but it sounds a little strange to me. Ill Informer is an instrumental Krautrock workout, with cosmic space textures and crunching guitars, easily the best thing on the album. It dissolves into a quiet keyboard segment that reprises the theme from The Glam Dicenn, and nicely segues into the latter part of said tune to close the album. The final 16 minutes of The Glam Dicenn move from dreamy synthesizer and Julian's melodic vocals into spaced-out electronics and ambient mellowness, reminiscent of early Tangerine Dream, and finally bring back to the main theme in a grand finale. There's a sixth, unlisted track on the album, that starts with 5-minutes of silence, followed by a soul-influenced chant. Though the liner notes make no mention of it, the silence is supposed to be a John Cage-like time for listening to the sounds around us, something Cope apparently did in his concerts. I find it a good time to get up and turn off the CD player, as The Glam Dicenn is a nice ending to me. The final hidden track is really unnecessary. So whatever this is, there's a lot to enjoy here. But is it essential Julian Cope? Not really. It's great for fans, and an interesting diversion if you're looking for something different. Available from Julian Cope's Head Heritage web site: http://www.headheritage.co.uk/.